Donore Avenue Parish Church is dedicated to Saint Therese of Lisieux. Saint Thérèse of Lisieux or Saint Thérèse of the Child Jesus and the Holy Face is also known as “The Little Flower of Jesus”. 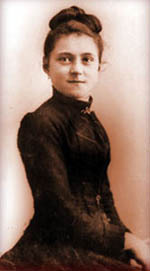 She was born Marie-Françoise-Thérèse Martin on 2 January 1873. She was a French Carmelite nun who entered Carmel at the age of 15. She achieved perfection through the daily renunciation of little things, and through prayer and mediation on the life of Christ. She wanted to be a missionary, and as her health made this impossible, offered her daily life within the convent for the mission of the Church. She died on 30 September 1897, aged 24. Her feast day is on 1 October. She was canonised in 1925 and Donore Avenue Church, which was opened on 15th May 1926, was one of the first churches named in her honour. Each year the Parish Liturgy Group organises a Triduum from 29 September to 1 October. As well as her shrine on the left hand side of the Church, her image is depicted on the stained glass window behind the altar. 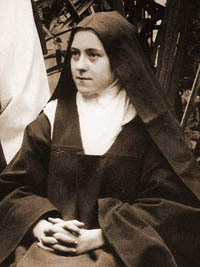 Saint Thérèse felt an early call to religious life, and overcoming various obstacles, in 1888 at the early age of 15, became a nun and joined two of her older sisters in the cloistered Carmelite community of Lisieux, Normandy. After nine years as a Carmelite religious, having fulfilled various offices such as sacristan and assistant to the novice mistress, and having spent the last eighteen months in Carmel in a night of faith, she died of tuberculosis at the age of 24. The impact of The Story of a Soul, a collection of her autobiographical manuscripts, printed and distributed a year after her death to an initially very limited audience was great, and she rapidly became one of the most popular saints of the twentieth century. Pope Pius XI made her the “star of his pontificate”. She was beatified in 1923, and canonised in 1925. Thérèse was declared co-patron of the missions with Francis Xavier in 1927, and named co-patron of France with Joan of Arc in 1944. On 19 October 1997 Pope John Paul II declared her the thirty-third doctor of the Church, the youngest person, and only the third woman, to be so honored. Devotion to Thérèse has developed around the world. The Basilica of Lisieux is the second largest place of pilgrimage in France after Lourdes.